The Federal Reserve is under scrutiny again as Senator Rand Paul reintroduces his Federal Reserve Transparency Act, widely known as the “Audit the Fed” bill. The Act will ultimately prevent the Federal Reserve from hiding its operations information from Congress, forcing transparency onto the privately run organization. And what’s more, President-elect Donald Trump, who has spoken out against the Federal Reserve’s central banking system during his campaign, appears to support the Audit the Fed bill. “No institution holds more power over the future of the American economy and the value of our savings than the Federal Reserve,” said Sen. Paul, “yet Fed Chair Yellen refuses to be fully accountable to the people’s representatives. a part of a discussion or communication among or between members of the Board and officers and employees of the Federal Reserve System related to clauses (1)–(3) of this subsection. The last notable time someone challenged the Federal Reserve was in 1963, on June 4. An executive order known as 11110 was signed with the intention of basically stripping the Federal Reserve of its power to loan money to the U.S. Federal Government at interest. President Kennedy at the time, declared that the Federal Reserve was on borrowed time. At the time of Kennedy’s assassination $10 and $20 United States Notes were being printed by the Treasury – “to issue silver certificates against silver bullion” and essentially undermining the Fed Reserve’s power with the interest-free and debt-free currency. Unfortunately, the Notes were pulled from circulation and Kennedy met his fate on Nov. 22, 1963. It makes sense to question the policy of the Federal Reserve, argues Styxhexenhammer666 of YouTube. Forcing transparency holds them accountable, and to some degree, assists with a fairness, albeit a small amount. Nonetheless, it’s important to recognize that the auditing of the Fed will be a difficult road to traverse, but at least for now it seems possible. What comes of the audit, however – if it eventuates – will be big news when the transparency forces the slime to float to the surface. But the audit has to get through Trump’s Congress first. 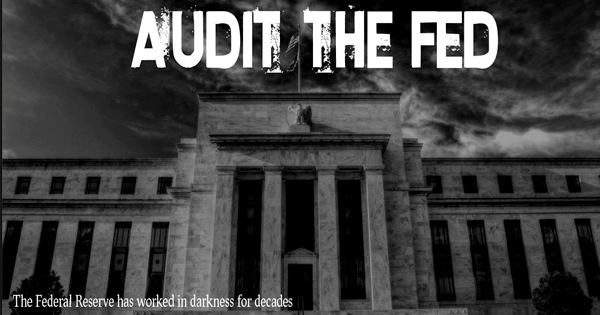 This article (Sen. Rand Paul Reintroduces “Audit the Fed” Bill) is a free and open source. You have permission to republish this article under a Creative Commons license with attribution to the author and DNewsHQ.